BOULDER,Colo. - A new NASA probe slated to launch in 2013 will take the most detailedlook yet at the atmosphere of Mars. A team led by the?Laboratory for Atmospheric and Space Physics (LASP) at the University of Colorado, Boulder, will design, build and operate the MarsAtmosphere and Volatile Evolution (MAVEN), an orbiter designed to study theupper atmosphere of the red planet and its interactions with the sun. The win was billed as the largestresearch contract ever awarded to LASP, during a Sept. 15?press briefing it held here todetail the selection decision. 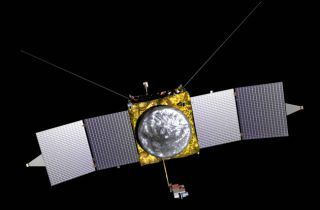 A consortium of groups led by LASPwill build the $485 million MAVEN spacecraft and carry out mission operation duties. The teamincludes?the University of California,Berkeley; NASA?s Goddard Space Flight Center, Greenbelt, Md. ; NASA?s JetPropulsion Laboratory, Pasadena, Calif.; and Lockheed Martin Space Systems inLittleton, Colo.
Set to launch Nov.?18, 2013, MAVEN should take?about 10?months to reach Mars and enter orbit around the redplanet on Sept.?16, 2014. ?We?ve gota team that?s ready to go,? said Bruce Jakosky, LASP associate director and principal investigatorfor the mission. ?MAVEN is to study the upper atmosphere of Mars, how gas islost to space and how the planet interacts with the sun and with the solar wind.? MAVEN willcarry eight science instruments on boardthat are divided into three packages, Jakosky said, collectively makingmeasurements needed to constrain that loss-to-space process. ?Thismission is really about understanding the history of the Martian environment,?Jakosky said. ?Our goal is to understand how gases are lost to space today andhow the processes responsible for that loss have operated over the last 4 billion years,? he said. Cindy Schulz, systems engineer forthe spacecraft from Lockheed Martin Space Systems, told SPACE.com thatMAVEN?s development, in order to keep costs low, will draw upon a heritage of Marsexpertise at the company. Schulz saidMAVEN?s structure and propulsion system are designed to be similar to the MarsReconnaissance Orbiter, now orbiting the red planet. MAVEN willbe the second mission of NASA?s Mars Scout program, a recent initiative by theagency for smaller, lower-cost spacecraft. The first Mars Scout mission is the Phoenix MarsLander, which launched in 2007 and now is operating on the red planet?ssurface. It too was built by Lockheed Martin Space Systems and is managed by Edward Sedivy, who?now will serve as the spacecraftmanager for MAVEN. The LASP?s multiphase MAVEN proposal was five years in development. Jakosky saidthat all of MAVEN?s science instruments have heritage, and were picked fortheir ability to detail Mars? upper atmosphere and the interactions with solarwind. ?There havebeen a few scattered measurements, especially from [the European SpaceAgency?s] Mars Express, and some of the Russian spacecraft that hinted at someof the processes. We know many of the processes are going on today, but wehaven?t had the simultaneous measurements that let us really understand how theprocesses operate ? and allow us to extrapolate back in time,? Jakosky said. The selection of MAVENwill?impact LASP in many ways - scientific,cultural, monetary?and programmatic, said LASP DirectorDaniel Baker. ?We have very much wanted toestablish clearly through hardware leadership that we are at the forefront ofMars science. This win does that,? he said. Baker saidthe selection shows that a university team can compete and win in the currentNASA culture. The larger slice of the funding coming to both LASP and Colorado is key, he added, with the programmaticpartnership tie to Lockheed Martin and NASA Goddard expected to serve LASP wellin the future. Jakosky notedthat the consortium of five institutions means that the MAVEN mission wouldbring some $60 million directly to LASP, with roughly $120 million provided toLockheed Martin. MAVEN was selected over another Mars Scout competitor: TheGreat Escape mission proposed by Southwest Research Institute, San Antonio. The Great Escape mission also was proposed to study Mars? upper atmosphere,including its dynamics and evolution, which has been check-listed as a highpriority by the scientific community. In the first round of the Mars Scout2006 competition, the MAVEN and Great Escape missions were down-selected for2011 out of 26 proposals for further evaluation in a concept study phase. However, in December 2007, NASAannounced that the launch of the next mission in the Mars Scout program - originallyplanned for 2011 - was being delayed until 2013 due to an ?organizationalconflict of interest? that was discovered in one of the mission proposalteam?s Phase A Concept Study, NASA reported at the time. ?Because ofthe delay, we had the opportunity to re-evaluate how long we needed to makeobservations in order to obtain our science results,? Jakosky said. ?We wantedto propose a mission length that was tied strongly to the ability to achieveour science goals. In the end, we felt that one year was appropriate, and thatwas what we proposed.? Jakosky also noted that another factor is the declining solar cycle duringMAVEN?s mission, which?would mean relatively few major solarevents after one year of observations. ?Thus, one year also meshed well withwhat we are most likely to be seeing,? he said. ?MAVEN willbe making measurements for one Earth year - which is long enough to give usaccurate measurements of the entire region of near Mars space that is importantto us,? Jakosky said. Additionally, once in orbit around Mars, MAVEN is being equippedto operate as a telecommunications relay for future landers, he added. TheUniversity of Colorado, Boulder, is the single largest universityrecipient of NASA research dollars in the nation, according to the spaceagency. In fiscal year 2008, it received roughly $56 million from NASA. BruceBenson, president of the University ofColorado, Boulder, underscored the fact that the MAVEN win is the largestsingle research contract in the university?s history, with space studies beinga critical piece of Colorado?s space economy - which is second only toCalifornia. ?We?re quickly becoming a university of the universe,? he concluded.